I've always been a fan of the writings of Bill Bryson since I discovered his book "Neither Here Nor There" while living in Sweden, and he presented the hilarious idea that he expected to see Swedes walking down the street in miner's helmets, with lamps illuminated. This was in response to the preposterous notion of all cars in Sweden having their headlights come on automatically, even during bright summer days. I had often thought it was somewhat ridiculous for cars have their headlights on at all times, too, so the notion that this would somehow apply to people as well was just hilariously appropriate. Sadly, I don't think the miner's helmets have caught on among the pedestrians, yet, but I expect to see it eventually . . . 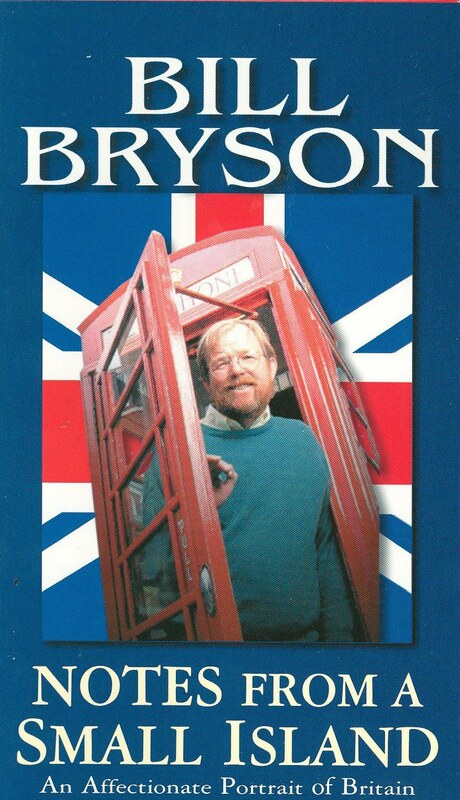 I'm always thrilled when there is a new book out by Bill Bryson, and it's even better to listen to him reading his works as audio books. I was therefore thrilled to discover a TV program he did in the late 1990s called Notes from a Small Island (based on his book of the same name). At the time of the filming, Bryson and his family had moved back to the US after living in Britain for over 20 years. He decided to write about all the things he loved and would miss about Britain (although he subsequently moved back to Britain and continues to live there today). The series is divided into six episodes where he discusses things such as sports (including those little known contests such as pipe smoking), disused underground stations, British inventions and London cabbies. There are occasional appearances by celebrities such as Stephen Fry and Alexei Sayle, although they just tend to pop in and out without much introduction or fanfare. And that's really appropriate, since the focus here is on Britain and what makes it great. My favorite episode had to be the one where Bryson tried to figure out why the British are so fond of traveling to freezing, windy, miserable seaside resorts, only to sit stubbornly on chairs on the beach for the duration of their visits. As a fellow American who also appreciates all things British, I can totally appreciate Bryson's enthusiasm and wonder. I just wish there had been more time spent on some of the topics. The visits to each area and subject are quite brief, but overall the program does a good job of showcasing different aspects of the British landscape and character. I for one am happy that Bryson was able to return to the country he loves, although I do wish he would get out more and write some more travel memoirs.